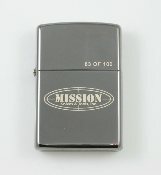 Ziippo lighter with Mission Knives And Tools Inc. Logo on front. Black Chrome Finish. Includes collectors tin with logo on front of it. This is number 83 of 100 produced.